Working as a technical consultant from the very beginning I gained rich experience in large-scale system integration on time/quality critical projects. Profound understanding of state-of-the-art transactional systems and experience with application servers configurations and deployments, as well as security integration add to my ability to drive any team forward. I like to think of myself as ambitious and communicative person, willing to learn and improve constantly through challenges and ever-increasing quality demands. Being a technology aficionado helps, but it's each of the success stories I've been involved with that drives me forward. Full time job as Senior Software Consultant, participating in a project related to data mining of veterinary-related information. Responsible for technical design and development of different applications, frameworks and reports, refactoring and optimizing existing ones, as well as code review and daily communication with clients. Technology Highlights: Ruby on Rails, AWS (EC2, RDS, S3), PostgreSQL, Heroku, Salesforce. Full time job as Senior Software Developer and Team Lead, leading a team of four on a project related to financial transactions and money transfer (SWIFT & SEPA). Responsible for business analysis, technical design and development of both back-end and front-end applications, creating new and maintaining / re-factoring existing ones, as well as direct communication with clients and providing on-site consulting services when needed. Technology Highlights: Java SE (MultiThread, RMI, H2H), Spring, Thymeleaf, Hibernate, Derby, MySQL, Tomcat Server. Full time job as Senior Software Developer, working for the CMS Team. In charge of development of Web and Standalone applications, analysis and technical design, as well as application deployments and configuration. Technology Highlights: J2EE, JSP, STRUTS, Spring, Hibernate, DB2, Websphere Server, Tomcat Server. Full time job as Software Engineer, working as external/consultant at MedNet International on MedNeXt application migration project. Responsible for developing, maintaining and improving functionality of one of the leading Health Insurance Management Applications using Oracle ADF 11g Framework, as well application deployments and security integration. Technology Highlights: Oracle ADF 11g, Oracle PLSQL, Weblogic Server and Active Directory LDAP. Full time job as Software Engineer, working as external/consultant at Ministry of Internal Affairs, being one of the leading men on Digital Personal Documents project. In charge of many sectors, such as: Web Application itself, Data Structure and Security Level (Roles/Policies and Error Prevention/Recovery), as well as application deployments and configuration. Technology Highlights: J2EE (EJB 2.0, Servlets), JSP, STRUTS, Oracle PLSQL, Websphere Server and IBM LDAP. Creator of more then 15 complete solution dynamic and static Web Sites, as well as 3 desktop applications for different clients, mostly companies from Serbia, but also Angola, Brazil and Bosnia. - Great experience in Application Deployments and Application Server administration. - Rich history in 3rd party products integrations (AWS, SalesForce etc.). - Security Layer knowledge (JAZN, LDAP, WebSeal). Bachelor of Electrical Engineering (B.E.E. ), University of Belgrade, School of Electrical Engineering, Department of Computer Science and Informatics. Microsoft course 2274B: Managing a Microsoft Windows Server 2003 Environment. 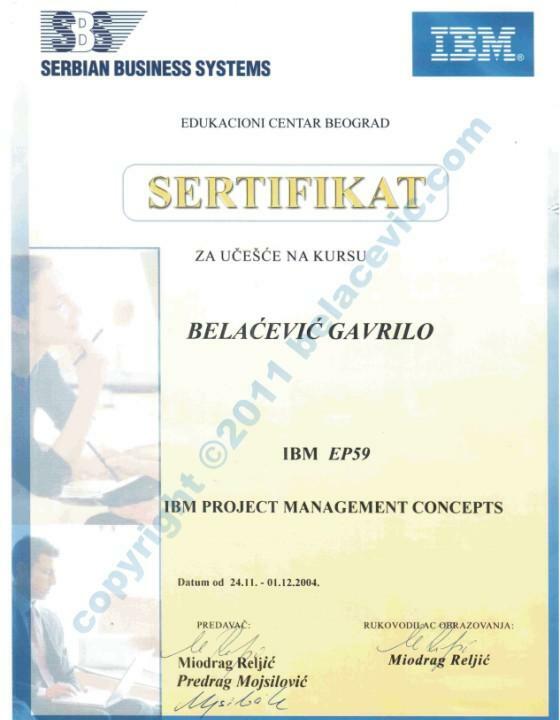 Certificate of attendance of IBM's course IBM EP59: IBM Project Management Concepts. English - Fluent (spoken and written). Italian - Average knowledge of spoken and written language (certificate of three finished courses at institute of foreign languages "Ðuro Salaj" in Belgrade). German - Average knowledge of spoken and written language (certificate of two finished courses at school of foreign languages "Swanbell" in Belgrade). Spanish - Basic knowledge of spoken and written language (certificate of two finished courses at institute of foreign languages "Ðuro Salaj" in Belgrade). Gavrilo is creator of many static and dynamic web sites, most of them made for serbian companies, but some are currently representing companies from Brazil, Angola, Bosnia and Greece. Below is the list of some of the most important projects with the respective technologies used, sorted chronologically descending. There are couple of desktop products made by Gavrilo, each one of them fully customized for specific client, thus unique and not available for further sale. Some of them are very simple, Java based applications, but others, such as the one described below, are complex, full business-flow control systems, on which the owning company's everyday work is relying on. Maybe the most complex one, and the one that is being used by the greatest number of users is EPK2. This was the greatest Gavrilo's freelancing project and it is in production since 2007. Company for which it was created, Projurs A.D. - Belgrade, was in a need of fully-customizable, multi-user system which would take control of the complete business process. 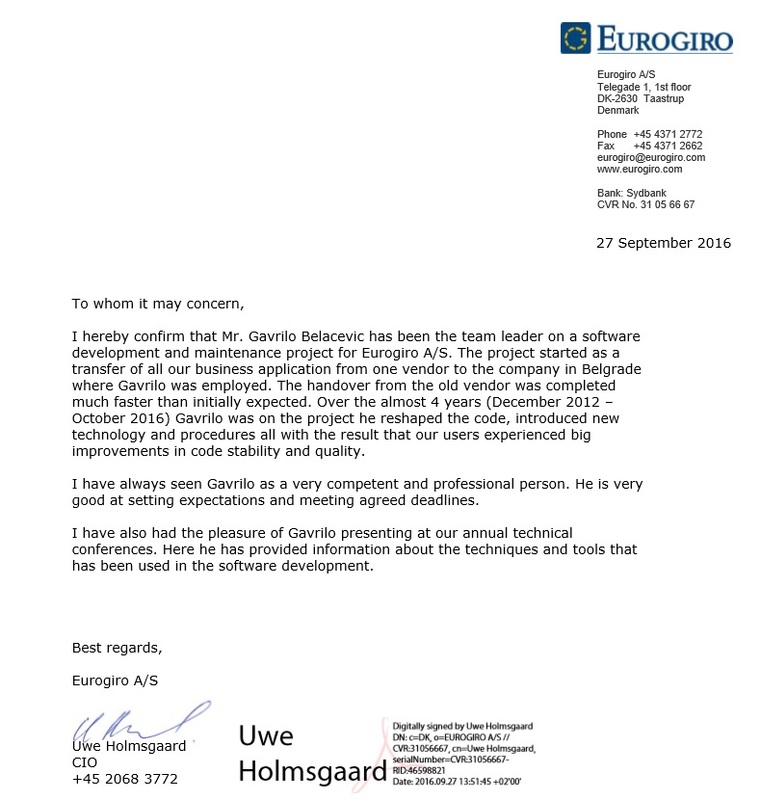 It took more than three months for project to complete, as Gavrilo was working alone, in charge of Database, Business Logic and GUI. Technology used in this case was ObjectPASCAL and Paradox Database (Delphi 6.0 enviroment). 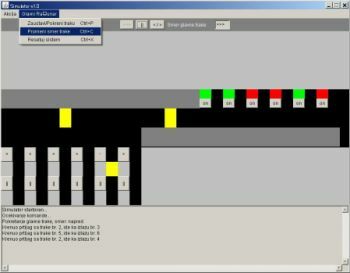 As part of some University researches Gavrilo was given a chance to create a simulator using Java (Threads & AWT). The idea was to present behavior of a Microprocessor based system, in charge of airport luggage control and transportation. This task combined different types of skills, including Microprocessor system design, Java Language programming, Sensor and other peripheral components logic etc. When finished, this application was a fully functional airport luggage transporter simulator, having all the functionality as a real one. Today I joined a rapidly growing team of exceptional software developers, taking a position of Senior Software Consultant. Moving from Java to Ruby was one of the key points in the decision to leave Seavus which offered so much to me in the past four years. After more than a year of development and data preparation a new automotive portal has come to life. I'm the only person behind the idea, coding and design of the web portal. International version is due within couple of months. I finally finished the studies at University of Belgrade's School of Electrical Engineering, more specifically Department of Computer Science and Informatics. My graduate exam (Web System for Continuous Medical Education) scored the highest grade today. As of today I will make part of SEAVUS team, being appointed to a Senior Software Developer position. I'll be performing within Java/Oracle Division of the swedish company. Leaving ArsBlue is not something I'm too happy about, but I see this as a great chance to improve and learn new things in an agile environment. After months of development, testing and preparation a new auction web site is born. I am one of the three creators of the web portal and claim 33% ownership. You can now browse/view/download some of the relevant documents that could be found in the documents section of this website (docs tab). As of today I'll be working for Arius Belgrade for the second time. The company has changed name to ArsBlue but it's still the good old team I enjoyed working with in the past. They announced me as a Senior Software Developer for the CMS Team. Today I resigned from the European Dynamics position after having agreed terms with his former company - Arius. 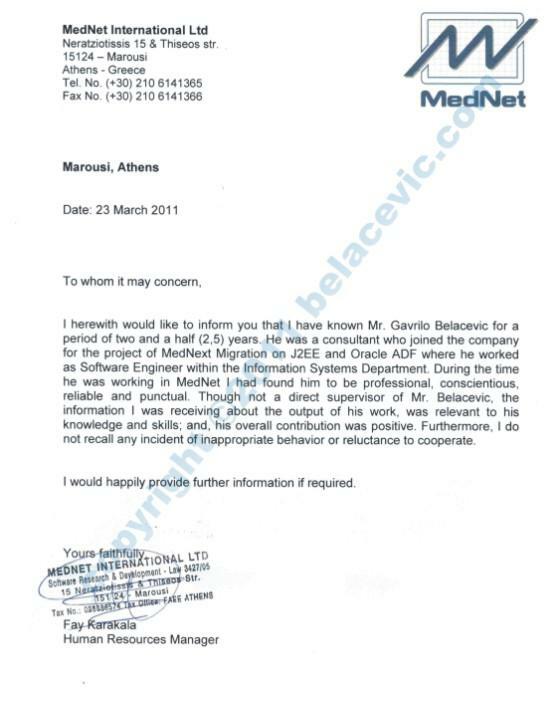 This will bring to an end a two and a half year period of consulting activities I performed for MedNet International. Possibility of obtaining the Bachelor degree back in Belgrade was one of the key points in the decision I made. On the Curriculum Vitae part of this web site you will now find downloadable versions of my CV, both in Adobe Acrobat Reader (.pdf) and Microsoft Word (.doc) format. Feel free to download, print and share this document. From today you are viewing the new version of this web site. This version is optimized and light-weighted. I wish you a pleasent stay on my official internet presentation! 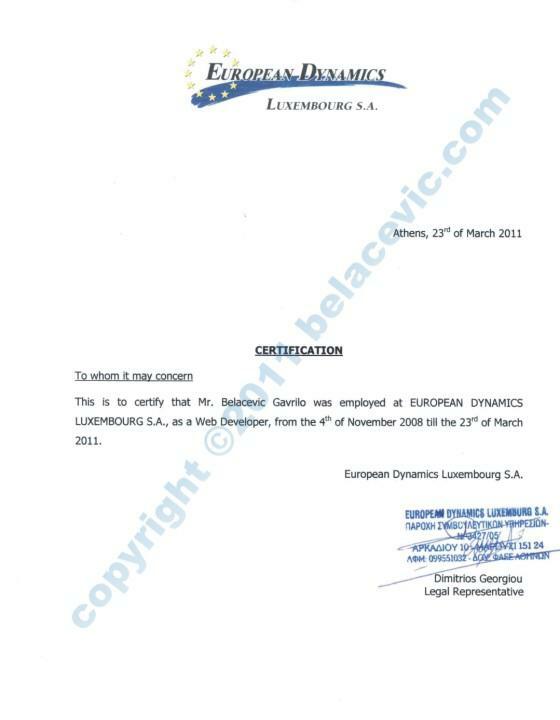 Today I officially became employee of European Dynamics. For now, I will be performing as external at MedNet International, on MedNeXt application migration project. My maritial status has just changed to married. After some initial negotiations, I accepted a full time job offer by Arius. I'm assigned to a challenging position of being the youngest ever (22 years old) software consultant within the Ministry of internal affairs. Copyright © 2008 - 2018 Gavrilo Belacevic. All rights reserved.